New parking fines will go into effect in downtown Delaware on Wednesday in an attempt to improve downtown parking turnover. As reported previously by The Gazette, the changes were approved unanimously by City Council on June 8, giving the public 30 days’ notice before the changes became official. • The fine for parking over the time limit in metered spaces increases to $7 if paid by midnight; or $10 if paid later. Currently those fines are $3 and $5, respectively. • The fine for parking over the time limit in non-metered, two-hour spaces increases to $40 from the current $10. • Repeat offenders can expect enhanced fines. • A boot device could be attached to the wheel of a repeat violator’s vehicle. A $100 fee, plus the cost of all outstanding parking tickets, will need to be paid to remove the boot. If the payment is not made within two hours, the city will tow the vehicle. Tampering with the boot will result in charges of criminal damaging or theft. This is the first time the parking fees have been changed since 1991. City Council member Kent Shafer formed a downtown parking committee to look into how to deal with some people who work downtown who are parking all day in spots meant for customers who are parking short-term. 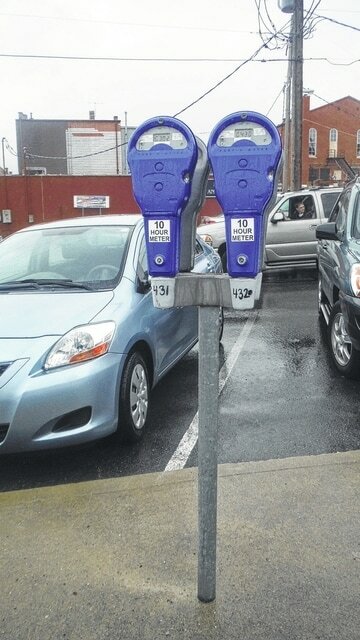 Monthly permits for parking at city lot blue meters costs $25; or $20 at the East William Street lot. The permits are available at the police department, 70 N. Union St.; or from a parking control officer. “Long-term parking enhancements included the potential of adding a parking structure in the downtown,” the survey stated. City officials have asked if the new county courthouse might be available for public parking, particularly after hours. However, county staff has expressed security concerns about allowing the public to park on the five-story courthouse’s three-level parking lot. City police did not respond to a request for comment as The Gazette went to press.